Why has Western-themed art always been so popular with collectors? So many of us are interested in the stories of the American “Wild West” and the characters who colored our history there. 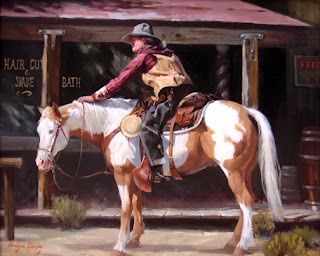 To me, Western art has a unique duality: the romanticism of traveling through beautiful country on a horse and the tough, grittiness of the cowboys who embrace this life. At Wilde Meyer Gallery, there are several artists who have brought their own subjective interpretation to the theme of western art. Their styles range from traditional to contemporary, and their subject matter focuses on landscapes, wildlife and the people who follow the western traditions. "Once He Rode the Wild Horses" acrylic on panel 24"x24"
Jim Nelson uses very intense colors, which he says are based on the sacred colors of the Lakota people. He is a descendent of Wendel Phillips, a noted Indian rights advocate of the late 1800’s. Nelson says, "Through my paintings, I attempt to illustrate the legends and spirituality that was taught to me by my grandmother. The subject matter I paint is not a modern Indian, but a people at a period of time when animal spirits were tied to everyday life. In our modern world, an inquisitive public is reaching back into the ancient times for a simpler way of life and the basics; the sky, the earth and the open prairie." 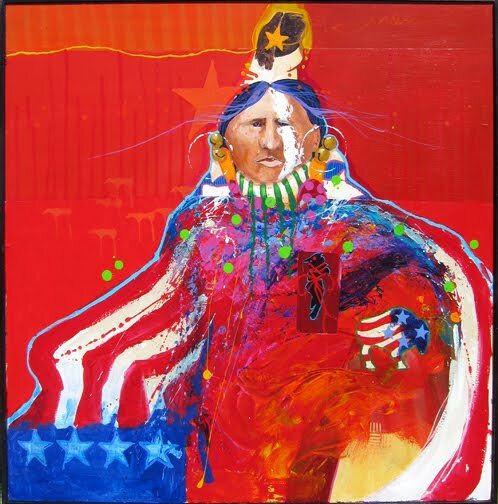 In this painting, entitled “Once he Rode the Wild Horses,” Nelson uses red and other primary colors to depict the strength of this noble man. His direct gaze at the viewer is riveting, and Nelson’s use of the American flag design on his clothing and in the buffalo appliqué provide thought-provoking irony. To me, the green spots that dance across his chest create additional energy in the painting. Paul Sheldon refers to old western photographs to make sure his cowboys’ clothing is accurate. But his paintings are far from traditional! 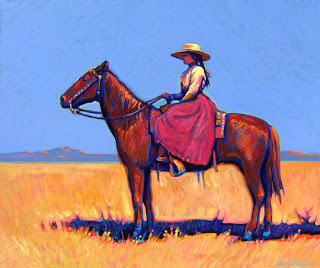 His strong colors energize his western scenes and give his paintings a contemporary edge. In “Montana Busters,” two figures sit straight on horseback against a flat, stylized mountain background. The grassy plain in the foreground is bright red – a considered choice of subjective color – broken by the long cobalt blue shadow. 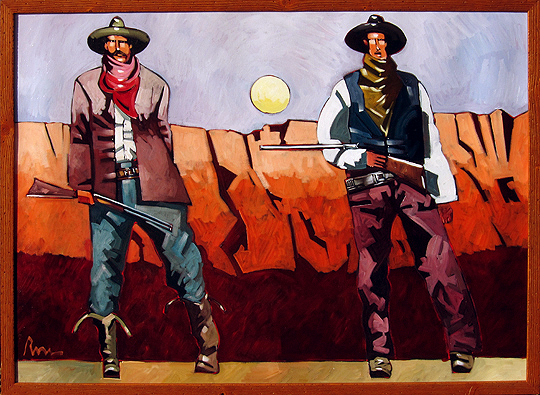 The turquoise outlines around the cowboys make them appear three dimensional, standing out in front of the background. "Moonrise Over the Red Wall" acrylic on canvas 31.5" x 41.5"
Thom Ross is another Wilde Meyer artist who interprets Western art in a personal way. Thom brings his love of history and story-telling to his paintings, which he sees as a “contemplation of history and the people and events which so shaped it." 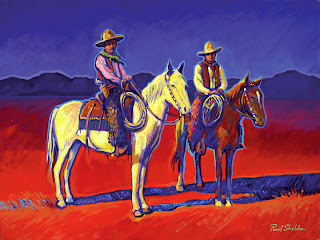 In “Moonrise over the Red Wall,” the two cowboys take a tough stance, staring at and assessing the viewer. The artist’s strong brush strokes; unusual horizon line; and stylized mountains topped by a flat moon sphere definitely get my attention. There’s some very strong masculine energy here, and I expect these guys to come to life and start shooting! "It's a Hair Cut and Shave" oil on canvas 24.5" x 28.5"
﻿ Carolyn Hawley presents a much more traditional view of the western cowboy. In “It’s a Hair Cut & Shave,” her subject sits in the center of the painting, astride his horse. He looks like he’s just come from a long trip (his horse looks a little tired..) and he’s contemplating whether he should dismount and get cleaned up at the local barbershop. Carolyn uses sunlight very effectively to make the cowboy and his beautiful horse stand out against the darker background. 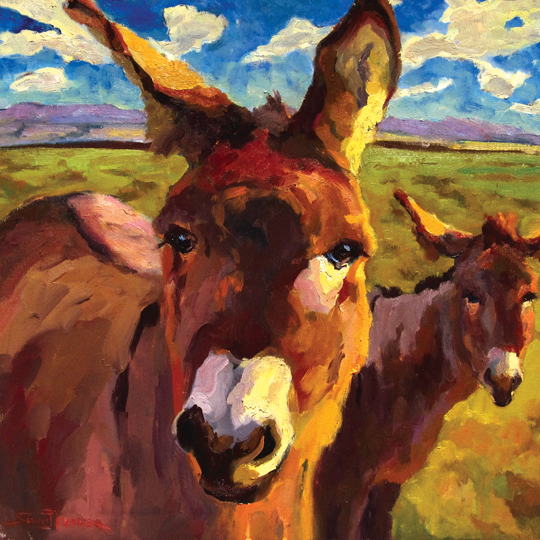 "Beyond the Burros" oil on canvas 31" x 31"
Western wildlife is Sarah Webber’s passion. Her painterly close-ups of southwestern birds and animals show her love of these creatures, as well as her love of the painting process. These animals look so interested in the viewer! I think any of Sarah’s paintings would look great hanging near other western art, such as one of Carolyn’s pieces. 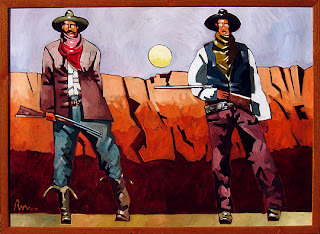 Writing this blog has really opened my eyes to the many different styles of American western art. I’m pretty impressed! 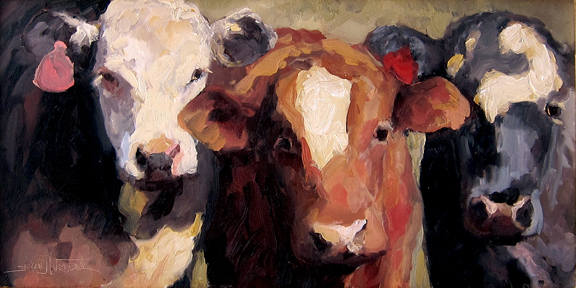 "Trick or Treat" oil on canvas 20"x32"
Wilde Meyer will have a special selection of Western art showing in October, click here for more information or send us an email. Wilde Meyer Gallery, 4142 N. Marshall Way, Scottsdale, AZ. 480-945-2323. 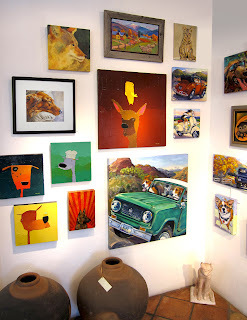 Also, please visit us during Western Artwalk on Thursday October 9, 2011. The 19th Dog Days of Summer show is now on the walls at Wilde Meyer and runs through the end of August. As usual, it’s a fun show, with more than 50 pieces of art displayed. 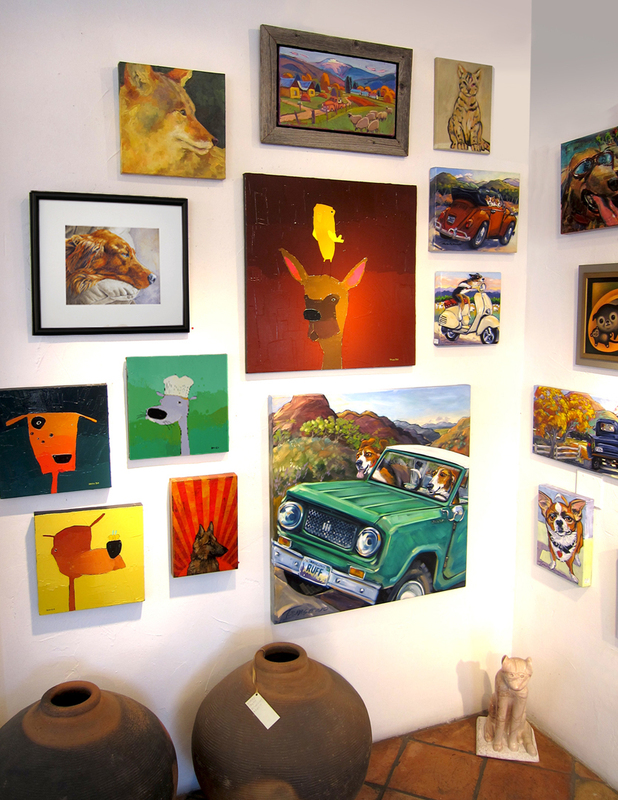 Most of the paintings are small, so if there’s an artist you’ve been admiring, now’s the time to acquire an affordable work, or just pick your favorite pooch. Click here for more visuals or contact us. 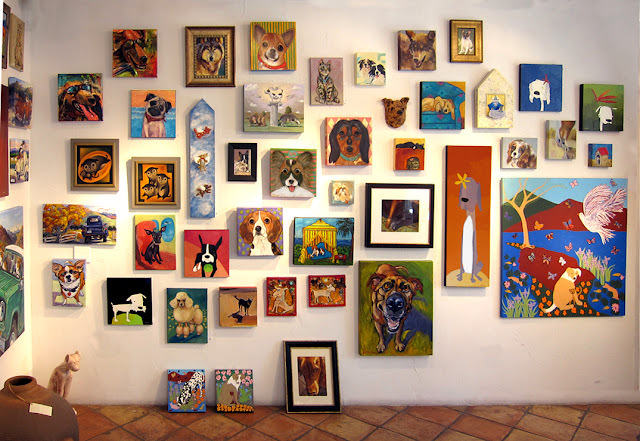 "The 19th Dog Days" runs in Scottsdale August 4, 2011 and continues through August 31, 2011. "The 19th Dog Days" runs in Tucson September 1, 2011 and continues through October 1, 2011. Wilde Meyer Gallery, 3001 E. Skyline Dr., Tucson, AZ. 520-615-5222.